Water jet cutting works by forcing a large volume of water through a small orifice in the nozzle .The constant volume of water traveling through a reduced area causes the particles to accelerate .This accelerated stream leaving the nozzle impacts the material to be cut. The extreme pressure of the accelerated water particles contacts a small area of the work piece. In this small area the work piece develops small cracks due to stream impact. The water jet washes away the material that "erodes" from the surface of the work piece. The crack caused by the water jet impact is now exposed to the water jet the extreme pressure and impact of particles in the following stream cause the small crack to propagate until the material is cut through. Long regarded as a tool for trained experts, abrasive jets have changed dramatically in the last few years. New technologies have made it possible for just about any machine or fabricating shop to purchase and profitably operate a precision abrasive jet cutting system, with little or no prior experience. The Water-Jet can work with a wide variety of materials, ranging from metals to non metal such as ceramics, composites, glass-even marble and granite. The finish provided by the water Jet Machine is a smooth sandblasted finish. No rough edges, burrs or jagged ends. Because the abrasive jet uses water and abrasive, the material is not heated up significantly during the cutting process. This makes the Water Jet Machine ideal for materials that are affected or deformed by heat, such as titanium. The Water Jet Machine uses water and garnet to cut. Garnet is an inert gemstone, which can be disposed of in the municipal waste stream. No toxic fumes are produced during machining. You don't need to change cutting tools with the Water Jet Machining. One nozzle is used to machine all the different types of materials and shapes, saving time and the expense of multiple cutting tools. Using the abrasive jet, there is little or no burr in most materials. The Water Jet Machine comes complete with a comprehensive CAD program (called Layout). You can draw parts from scratch in Layout, or import standard files created in other programs. 'Make' is the other main program provided as part of the DARDI Jet Machine. 'Make' takes the tool path created by Layout and calculates the exact position and cutting speed of the nozzle at a resolution of over 2,000 points per inch (800 points/cm). The Water Jet Machine can also work with your other machine tools to take advantage of the unique capabilities of each. An example of this is roughing out nested parts on the water jet to maximize material usage, and then performing final machining on a mill or machining center. Cold cutting without thermal influences. Flexible processing of virtually all materials with consistent high quality. Material-saving production due to reduced cutting width and the nesting of several parts on a single sheet. Maximum degree of material utilization due to the smallest of part separation distances (partially free of burrs) and part-in-part production. Tension-free processed parts due to minimal cutting force. Environmentally friendly and clean production without poisonous gases. Good access to the work area of the Waterjet system. Optimization of the cutting parameters to meet individual requirements. Close linking with the CAD / CAM programming system. High material savings due to narrow bridges or ribs. No tool manufacturing and tool storage cost. High productivity through multi head cutting systems and multilayer cutting. High-performance drive system, which permits high-precision production of parts as well as the highest of processing speeds. The combined production using Waterjet cutting machines and milling centers guarantees economical processing. The parts can be prefabricated and nested and only high precision areas are post worked. Fast setup and rapid programming. How much thick material abrasive water jet cutting machine can cut? What points should we consider for selecting a model? 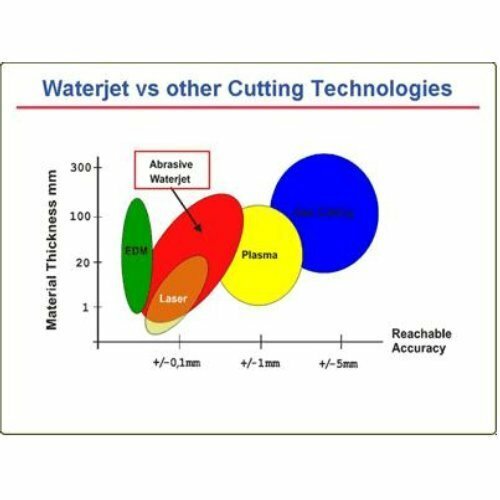 How much Positional Accuracy can Waterjet give? Our machine can give ≥ ± o.1mm positional accuracy. How much shall be the kerf width? Is there any special arrangement for saving material? It is ≥ 1mm. Our software has Nesting feature so material saving is possible by part in part cutting, close nesting, common cut, etc.